When you want to save some money on groceries, meal planning is the place to start. Not everyone, though, enjoys this household task. Why? Because they have certain preconceived thoughts telling them that it would be a waste to even try. Are you one of these people? 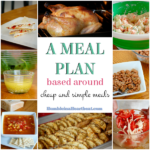 Do you have several reasons why you hate meal planning? This post is for you. You who doesn’t enjoy writing out a plan for what you’ll be eating for at least a week or two at a time. You who wants to meal plan but continues to put it off. When it comes to meal planning, I’ve tried just about every way you can think of. I have done a very detailed meal plan that shows what we will be eating for breakfast, lunch, snack, and dinner, for one or two weeks at a time. I have also done the lazy plan where I wrote down some food we could eat over the next week and called it good. I’ve never stuck to one way to meal plan for more than about six months at a time. For some reason, I get tired of the way I’m planning and switch things up. I wish I could just stick to one way for good! I believe I’m actually an anomaly when it comes to meal planning. Most people, from what I’ve heard, don’t plan out their meals at all. They wait until a couple hours or a few minutes before dinner and then decide what they will eat. This causes them much stress and anxiety during that time of day, and then they completely forget about dinner again until the next day when the same thing occurs. I am certain that the reason many people don’t meal plan is because they hate it. Maybe there are some underlying reasons why they hate it. 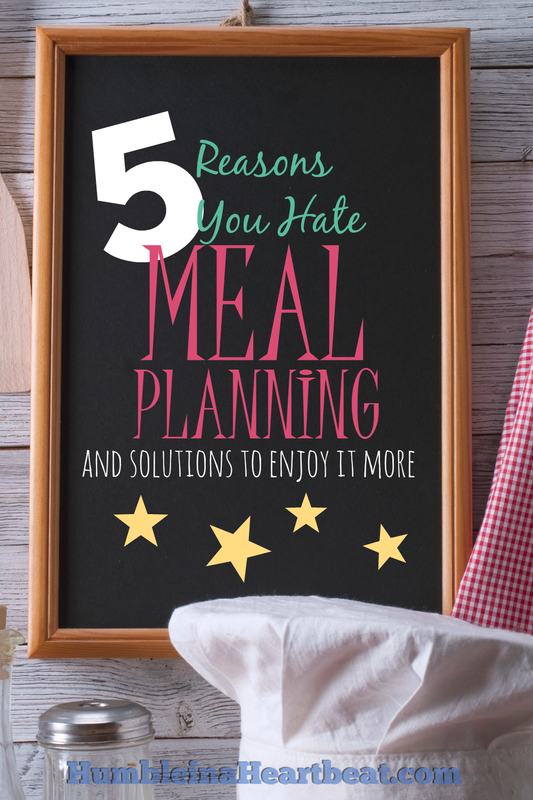 Maybe they don’t actually hate meal planning itself, they just don’t do it because of some other factors. 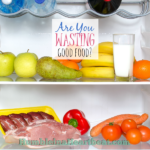 How about we find out what these factors might be so you, meal-planning-hater you, can start meal planning to save some money. You hate meal planning because you’re not organized. Meal planning requires that you be somewhat organized. Trying to put together a plan when you have no idea where all your favorite recipes are or what you ate in the last month is going to make things much more difficult. It would be great to have all your recipes in one consistent spot, wouldn’t it? If you were to get organized, meal planning would be a breeze. You would have all your recipes available, as well as past meal plans with the dates so you can refer to other menus to help plan this week’s. Don’t dismiss organization too quickly, friend, because you can certainly become an organized person. 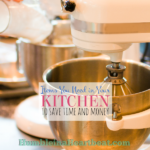 I am not a very organized person by nature, but I have found that being organized with meal planning is essential to getting it done quickly and saving the most amount of money. If saving money is important to you, try to get organized. 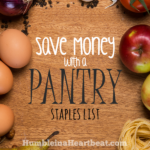 Start a pantry staples list. Keep all your recipes in one spot. When you try a new recipe, add it to your collection. If it is a keeper, file it with the others. If it’s not such a great recipe, write notes on it to improve it next time or throw it out. Have a folder where you keep all your past and present meal plans with dates. I love this idea from 365(ish) Days of Pinterest for a very easy meal planning binder! Keep a list of simple meals at the ready at all times. You hate meal planning because you are busy. Let’s see, the minute you get home from work, you have to tote Jimmy to soccer practice, and then you have to swing by the post office to pick up the mail, and then you have to go to the pharmacy to get Candice’s prescription. You’re a busy person. Understandable, since most people are. But this should not be an excuse to hate meal planning and never do it. If you are busy, that should be your number one reason to meal plan. Why? Because when you have a meal plan, you don’t have to go shopping every night, or stand in your pantry staring at a bunch of individual ingredients and wonder what you’ll cook tonight. You waste more time when you don’t meal plan than when you do. Believe me, I know that meal planning takes time. You have to make time to do it or it will not happen. You might have to write it down or schedule it in your planner. Set an alarm to remind you of the time you intend to meal plan. If you desire to spend less on food, you have to set aside time in your busy life to meal plan. It’s a requirement. And, hey, if you don’t believe me, read this post from The Soccer Mom Blog about how they were spending way too much on food because of their lack of meal planning. You hate meal planning because you thrive on spontaneity. Meal planning is so rigid. There is no room for flexibility and making what you feel like eating. Uh, wrong! There is no such thing as a right way to meal plan. If you enjoy spontaneity, go ahead and write a list of meals you’d like to make for the week and have the ingredients ready to go for when you want to make each one. You don’t have to write down the exact day you will make each meal. Just write a list of meals, and you can eat homemade pizza on Tuesday instead of Saturday if you want. 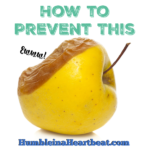 You hate meal planning because you are restricted. Do some people in your family have special diets? It makes it really hard to have variety in your meals when some foods cannot be served. 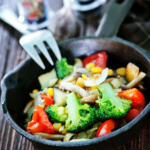 Vegetarian, gluten-free, and dairy-free diets can all be limiting in their own way. If you have someone in the family who eats a very strict diet from several of these categories, it makes it even tougher. For you, the meal planner and cook, the need to keep a list of meals at the ready is uber important. Thinking outside the box may seem almost impossible, but try to stay positive and work around the diet restrictions of family members. Out of respect to the individual(s) who cannot eat certain foods, try to rotate meals and never make the same meal twice in the same week. If you want to indulge in something that this person cannot, eat it when they won’t be around, if possible. For example, if your daughter cannot eat eggs, but you love them, wait until she goes to school to make your egg dish. Eat it for a late breakfast or for lunch. It may not be possible to do this if the person is around you all the time. If you happen to be the person who cannot eat certain foods, the best thing you can do is just keep a collection of recipes and meal plans that you enjoy and rotate them on a weekly or monthly basis. Always keep your eyes peeled for new dishes to add to your weekly or monthly rotation. Check out Yummly, AllRecipes, or Pinterest often. You hate meal planning because everyone in your house likes different food. For someone who wants to please each person in the house depending on their individual tastes, meal planning can become a nightmare. It might take you hours to finally get a plan ready that will cater to each person, each day, and at each meal. Cooking the meals will be even worse since you’ll have two or more dishes going at a time. Here’s what I would do. Forget about what each person likes and cook one meal. One meal that maybe some people in the family will enjoy and maybe some people will not. You cannot be a short-order cook just because some of your family members are picky. You have to teach them that your time is valuable and they should respect that. One way to make sure that each person is happy at least some of the time is to ask for their favorite meals and foods. Keep a list handy for each person and rotate meals based on each person’s favorites. One night could be Joe’s favorite dish and the next night could be Kim’s. Try to make side dishes that another person would enjoy even if they may not like the main dish. Meal planning has its benefits, but if you’ve always hated it, you may not be reaping those benefits. Get organized, make time for it, and keep it flexible so you can enjoy it much more. If there are individuals in the family who have special diets or who are picky, learn what their favorites are or what they will eat and try to work around that. When you make some of these changes, you probably won’t love meal planning, but I doubt you’ll hate it as much as you used to! Charlee, I love your statement, “You cannot be a short-order cook just because some of your family members are picky. You have to teach them that your time is valuable and they should respect that.” I’ve seen so many women wear themselves out and fail to provide their children with a variety of foods, all while proclaiming, “my kid’s just a picky eater”. I honestly believe that parents are responsible for turning their children into picky eaters. Variety is the only way!